Founded in London, England in 2005, Art Vinyl is the original way to display your favourite vinyl records. Perfect for music or art enthusiasts and those with an eye for stylish interior design. Founded in London, England in 2005, Art Vinyl is the original way to display your favourite vinyl records. Perfect for music or art enthusiasts and those with an eye for stylish interior design. The first real champions of Art & Design for vinyl records, Art Vinyl also curate exhibitions celebrating the best in sleeve design. For information on our latest exhibitions we would welcome you to join us on Facebook . Our unique Play & Display Flip Frame gives you the chance to stylishly display your favourite vinyl albums or 12″ singles and their contents on your wall. With this record frame’s unique design, you can also change over your display within seconds, without having to remove the frame from the wall. The Flip Frame has a unique quick release system; simply press the catch at the top and they hinge open. We understand that no two records are alike; with this in mind our Flip Frames are specially designed and manufactured to compensate for differences in the thickness of LP or 12″ records when displayed in the frame. This is achieved thanks to the unique ‘sponge finger’ system on the back of the Flip Frame, which ensures that any 12″ record will fit comfortably and securely inside. For more detailed views of the product features please click here. 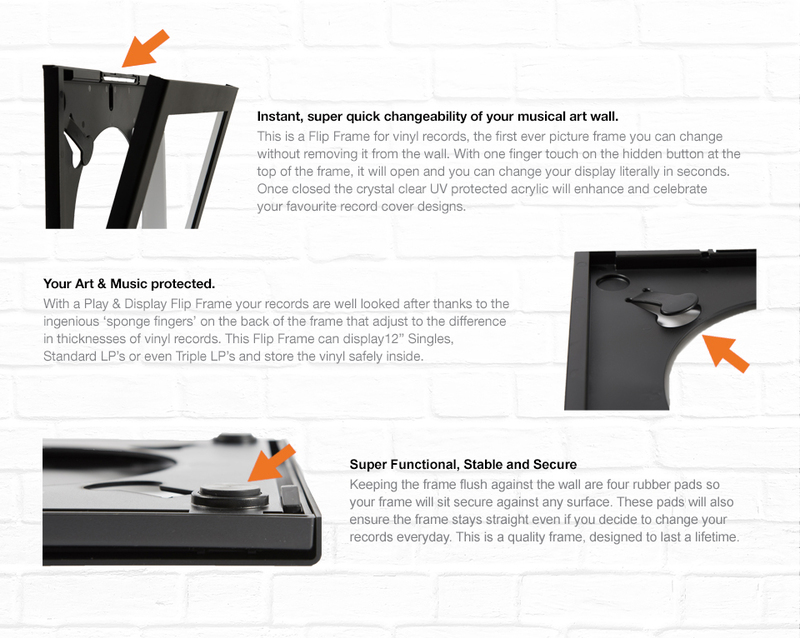 The Play & Display Triplepack of Flip Frames, allow you to develop broader vinyl record displays in your home. We understand how fans of music, art or interior design love to express their passion for vinyl art by using multiple vinyl records within their displays. The Triplepack give you that flexibility, while offering you great value compared with buying three frames individually. For more ideas on multiple Flip Frame displays check out our ‘Art Vinyl at Home’ pages on Pinterest . As a fan of Art Vinyl we would expect you to enjoy our Play & Display products for a lifetime as you can change your display over time, as you change or you discover more vinyl art. Using the Flip Frame for vinyl is our core product design objective but remember there’s a whole host of objects you can to complete your display such as Calendars, Prints and T-Shirts.